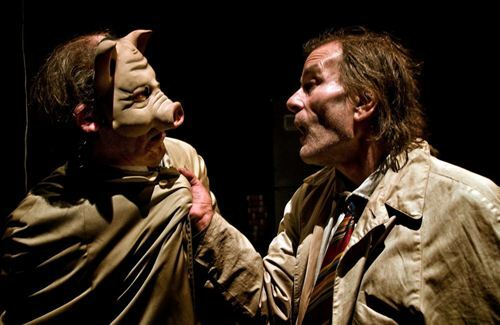 Just as George Orwell’s Animal Farm fuses a crafty fable with political commentary, so does Spanish theatre troupe La Zaranda’s play, El Regimen del Pienso, or “A Pig’s Diet,” which begins a sold-out run at Vasey Theatre, Sept. 5-7, 2013. While the shared porcine characters make comparisons to Orwell’s work easy, this play’s message is decidedly more Kafkaesque, with stooped workers reacting with dire helplessness in the face of bureaucratic restrictions in this allegorical tale told with poignancy and wry humor. These noteworthy Vasey performances mark this play’s first showing in the United States, and it will be performed in Spanish with English subtitles. The troupe, La Zaranda, is based in Andalusia, Spain, and has been in formation since 1978, creating a portfolio of work that has brought it international acclaim. According to its literature, the troupe is known for “using objects in a symbolic fashion, an art form that is at once simple and poetic, with polished genuine texts and knockout humor, (creating) productions both contemporary and alive.” A collection of theatre posters from La Zaranda’s past productions, as well as other interesting props and artifacts, are currently on display in the library’s first floor display window. La Zaranda’s visit to Villanova came through the good work of Mercedes Julia, PhD, professor and chair of the Department of Romance Languages and Literatures, and is co-sponsored by the VPAA’s Office, Dean of LAS, Cultural Studies and Latin American Studies programs. Additionally, Dr. Julia is co-hosting a special wine and cheese reception for Villanova faculty, and an opportunity for them to meet the troupe immediately following Thursday night’s performance. This reception is co-sponsored by the Library and will be held in Room 205. The Library offers many resources on Spanish theatre for those who wish to explore the subject in detail. 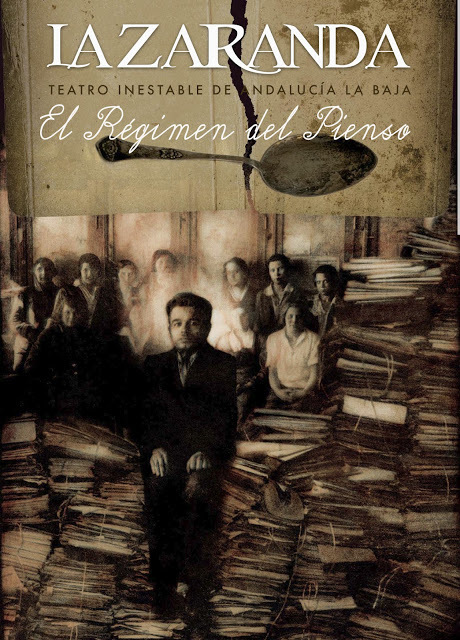 For our inaugural Dig Deeper blog entry, Research Support Librarian for Languages and Literatures Susan Ottignon has gathered links to contemporary, historical, and avant-garde aspects of Spanish theatre, as well as the general use of the theatre for political aims. Feel free to contact Ottignon or any of our librarians for more. Our new Dig Deeper series features links to Falvey Memorial Library resources curated and provided by a librarian specializing in the subject, to allow you to enhance your knowledge and enjoyment of events held here at the Library. Don’t hesitate to ‘ask us!’ if you’d like to take the excavation even further. And visit our Events listings for more exciting upcoming speakers, lectures and workshops! Susan A. Ottignon is Research Support Librarian and Liaison, Romance Languages and Literatures. She is also the Good Places to Start librarian! Joanne Quinn is the Team Leader for Communication and Service Promotion.